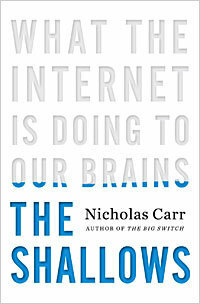 This is my summary of chapter one of The Shallows: How the internet is changing the way we read, think and remember, by Nicholas Carr. For my summary of chapter eight, the previous chapter, please click here. Desiderius Erasmus was one of the earliest scholars to recommend that his students keep a notebook in which they could note down facts they found to be the most significant, so they remained fixed in the mind. This idea evolved into a common place book, adopted by Francis Bacon, among other Enlightenment thinkers, serving as a chronicle of the intellectual development of many a gentlemen throughout the Enlightenment period. This practice gradually fell out of favour with audio and video and the development of artificial forms of memory, committing info seemed less necessary. With the widespread adoption of the Net, we have come to see memory as something which can be ‘outsourced’ to machines – we no longer regard memorizing facts as an efficient use of our brains – such things are better left to the Net, and our brains saved for more intricate, or more human matters. Various experiments demonstrate that physical changes take place in the brain with long term memory formation, and the quality of human memory depends on interactions long after the information is first received, on how the information is processed. The process of memory formation is complex, involving lots of interactions across different parts of the brain. Botanical metaphors are more accurate as descriptors than machine metaphors. Biological memory is alive, computer memory is not. The machine metaphor, where memory is concerned, is wrong: the brain cannot be full, it has an unlimited capacity to store and expand. We don’t constrain our ‘other’ mental powers when we store more information, we are not freeing up space when we outsource our memories to the net. The calculator made it easier for the brain to transfer ideas from working memory to long term memory and encode them in conceptual schemas that are useful to working knowledge – this highly specialized tool was a boon. Basically because attention is a key determinate of what we remember…. The influx of competing messages hinders…. And learning how to think really means learning to exercise control over how or what you think!On writing this book: He’s not immune! For my summary of chapter one (which links to further chapters) please click here. To purchase the book (it’s a cracking read!) please click below! This is my summary of chapter six of The Shallows: How the internet is changing the way we read, think and remember, by Nicholas Carr. For my summary of the previous chapter, chapter five, please click here. Book sales (of paper books) have remained fairly robust with the mass adoption of the internet. They are more robust – you can spill coffee on them without ‘killing’ them! You strain your eyes less when reading them. They are less distracting than reading on a screen. Carr now muses that new ebooks such as the Kindle may well take over from books. (Remember he wrote this book in 2010 when ebooks were still relatively new.) This seems likely given the cheaper production costs, and improving manufacture which improves the reading experience with ereaders. However, E readers are likely to change our experience of reading in the same way as the Internet. They have many of the same features embedded into them, such as hyperlinks and browsers. Carr now cites various examples of people’s experiences of reading using E readers, all of whom say they were more distracted (by looking things up on Google, for example), than when reading a regular book. Carr now suggests several ways in which E readers might change the way we write…. Do E readers change the way we read and write? In Japan, ‘cell phone novels’ have become increasingly popular – these are novels written via text message, with shorter sentences and less plot structure than regular novels. Publishing is seen as an ongoing process rather than a finished product. The impact of social media means that reading a book becomes less private. Today there are those who suggest that the decline of the book is nothing to lament…. Mark Federman, an education researcher argues that the time has come for teachers to abandon the linear, hierarchical world of the book and enter the Web’s world of ubiquitous connectivity and to develop the skill of discovering emergent meaning among contexts that are continually in flux. For my summary of chapter seven please click here. To purchase the book (it’s a cracking read!) please click below! For my summary of chapter three, please click here. In this chapter Nicholas Carr covers the evolution of writing technologies and their impacts on the human brain and the development of knowledge. When people first began to write, they simply scratched their marks on anything that was convenient, such as smooth faced rocks, or strips of bark. The Sumerians were the first to use a specialised medium for writing: specially prepared blocks of clay, and then the Egyptians began manufacturing papyrus scrolls around 2500 BC. The problem with scrolls is that they were expensive, but the development of the wax tablet meant writing technologies spread to more people: these were much cheaper than scrolls as they could be wiped clean and thus reused. In order to store lengthier texts people would lash together several wax tablets. The wax tablet also served as the model for the first book. This was created by an anonymous Roman artisan who first lashed together several sheets of parchment between a pair of rigid rectangles of leather to create it. However, it wasn’t until the introduction of the printing press in the mid 15th century that the book found its perfect medium. The printing press led to a ‘virtuous cycle’ in which the increased availability of books further stimulated demand for books. The 16th century saw the printing press go global and the first great flowering of printed literature: from Shakespeare to Milton and from Bacon to Descartes. Of course, there was also more ‘tawdry’ literature available, but this just help spread literacy to the masses. Carr argues that the arrival of movable-type printing was a central event in the history of Western culture and the development of the Western mind. For the medieval type of brain according got J.Z. Young, making true statements depended on fitting sensory experience with the symbols of religion. The letterpress changed that: As books became common, men could look more directly at each other’s observations, with a great increase in the accuracy and content of the information. The social and cultural consequences were as widespread as they were profound….. reading and writing became two main attributes of citizenship in a new ‘republic of letters’. Carr now argues that there is something of an intimate relationship between a writer and a book, and a reader and a book: the book encourages a focussed and sustained intellectual effort in a way that simply was not possible before the invention of the book. To read a book, at least one of the great literary works, one must follow an argument, a sustained narrative… this encourages intellectual development. Simply put, our great literary tradition of the last 400 years simply would not have existed without the technology of the book and the influence this had on the ‘neural pathways’ of so many of our great writers. However, with the infiltration of media and especially 2.0 technologies into the mainstream, the pathways of our brain are once again changing. For my summary of chapter five please click here. To purchase the book (it’s a cracking read!) please click below! Our intellectual maturation can be traced by looking at the way we draw pictures. Infants scrawl down only a very rough visual representation of what they see, as we get older, we develop the ability to represent pictures more accurately, with scientific precision. In very young children’s pictures there is no recognition of perspective or depth. As children mature, they develop a greater sense of intellectual realism – pictures display a greater degree of proportionality. Finally, children develop a sense of intellectual realism – they employ abstract scientific measurements to make their pictures even more accurate. The very first maps were simply scrawls in the dirt. Over many centuries these maps became more accurate and increasingly sophisticated scientific measurements were employed to portray regions with more precision. Finally, maps were developed to display abstract ideas in an efficient form, as with the London Tube Map for example. The London tube map – changing the way we perceive space? These historical advances in cartography didn’t simply mirror the development of the human mind. They helped change the human mind. The more frequently and intensively people used maps, the more their minds came to understand reality in the maps’ terms. The upside of this is that people are generally now more able to comprehend (unconsciously?) the unseen forces that shape their existence, because so many modern maps represent areas which we do not see in our day to day lives. What the map did for space, the clock did for time…. For most of human history, time was experienced as cyclical phenomenon, dictated by agrarian rhythms, and it ‘flowed’ rather than being divided into abstract chunks. All that started to change in the later half of the Middle Ages when monks started to demand more rigorous time keeping methods following an edict from Saint Benedict which stipulated that prayer should take place at specified times of the day. This spurred on the development of clocks which measured time. As commerce, industrialisation and urbanisation took place, clock-time became increasingly important to co-ordinate the activities of business. And the units of time by which we measured things became smaller too…hours became minutes became seconds. As clocks became smaller and watches became more popular, clock time infiltrated into our daily lives. The clock profoundly changed the way we thought – it made us perceive reality as broken up into discrete measurable chunks, all divisible into further sub-units. As Lewis Mumford said in ‘Technics and Civilization’, the clock ‘helped create the belief in an independent world of mathematically measurable sequences. The ‘abstract framework of divided time’ became ‘the point of reference for both action and thought’. Carr suggests that there are four categories of human technology, divided according to how they support our amplify our native capacities. Technologies which enhance physical strength include the plough, the ruck sack, the fighter jet. Technologies which enhance the sensitivity of our senses – the microscope and the amplifier for example. Finally, there are intellectual technologies, which extend our mental powers to find and classify information, to take measurements and make calculations and even to formulate and articulate ideas. 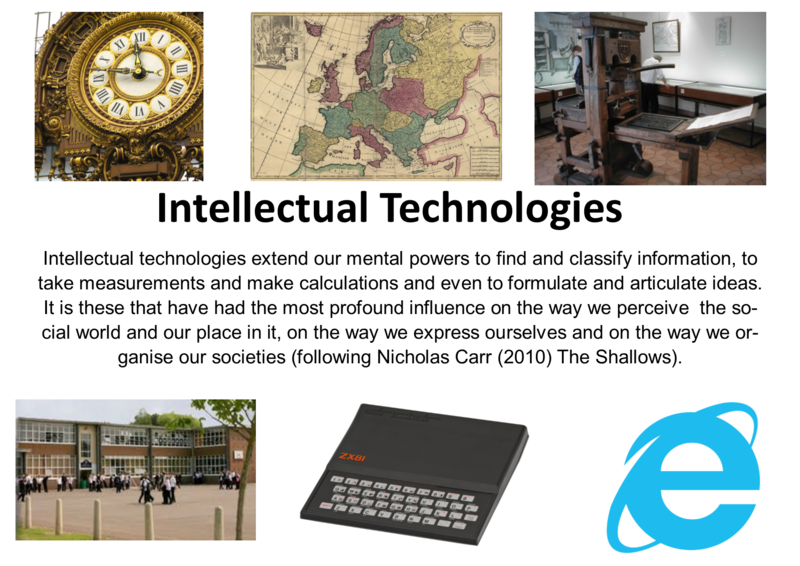 Carr provides many examples of intellectual technologies including: the clock, the map, the typewriter, the abacus, the sextant, newspapers, schools, library, the computer and the internet. All technologies are an expression of human will, and all change us to an extent, but is intellectual technologies which affect us the most deeply. It is these that transform the very way we perceive our place in the world, and the ways in which we express ourselves. There is an ongoing debate over the extent to which technology shapes the individual. Technological determinists argue that by and large technology shapes the individuals. This view is like that of structuralist sociologists who argue that society shapes the individual. Exponents of this view include Veblen, Marx himself, and McLuhan. Instrumentalists take the contrary view and argue that individuals play more of an active role in using technologies, and effectively have control over technology rather than being controlled by it. If you look at any particular technology at a particular time, then the instrumentalist view seems to be right. For example, the Amish have successfully resisted the use of many technologies into their culture. However, if you take a broader, more general and historical perspective, then it is hard to argue that we choose not to use widely adopted technologies such as the clock, the map, the school or the internet. ‘Though we’re rarely conscious of the fact, many of the routines of our lives follow paths laid down by technologies that came into use long before we were born’. The debate between technological determinists and instrumentalists is unlikely to be solved any time soon. This is probably because the stance one takes depends on the broad or narrow perspective which one has already subscribed to. However, most of us can agree on the fact that that technological advances are often turning points in human history. It is hard to imagine modern civilization without technology. Carr states that it is harder to measure the historical impact of technological developments on the neurocircuitry of the human brain. This is because, up until very recently, we simply haven’t had any way of measuring micro-level changes to the human brain. However, the recent findings which support neuroplasticity (outlined above) suggest that the brain is extremely malleable. It is therefore reasonable to posit that with every mass adoption of a new intellectual technology such as the clock, map, or internet, there is a parallel mass re-wiring of our neural circuitry. Each new technological development has influenced how we find, store and interpret information, how we direct our attention and how we remember and forget. New technologies have also influenced how we interact with others. In short, new technologies favour certain mental traits, leaving others to fade away. Carr further suggests that we hand down our habitual neural patterns to our children, which are further reinforced by schooling and the media. Genetic traits matter little in establishing the general neurological zeitgeist, it would seem. Nicholas Carr devotes the rest of the chapter to an account of how intellectual technologies may have shaped people’s mental capacities in a very broad sense. He theorises that the development of the alphabet and of a written, rather than an oral culture represented fundamental evolutionary shifts in human social development. A literate culture (rather than an oral one) was necessary as a basis for modern science. Carr has an uncomfortable sense that someone, or something, is remapping the neural circuitry in his brain. He feels as if he’s not thinking the way he used to think. He says that he used to find it easy to immerse himself in a book, but that’s rarely the case anymore… his concentration drifts after a page or two and he starts looking for something else to do. Deep reading used to be easy, now it’s a struggle. He believes this is because he spends a lot of time online, surfing and sometimes adding to the great databases of the net. He notes that there are positives to the internet – having so much information to hand is very convenient and means we can think and work more efficiently. He also recognises that skim-reading short snippets of lots of articles probably makes us more creative, as this encourages us to make a greater diversity of linkages between different information sets. However, the positives come at a price. McLuhan noted that media shape process of thought as well as supplying us with material to think about, and Carr thinks that the net is chipping away at his ability to concentrate and contemplate… Once he was like a scuba diver in a sea of words. Now he zips along the surface like a guy on a Jet-Ski. He is not the only one who believes that the internet is changing the way he thinks: friends have made similar observations as have various bloggers. For example, Bruce Friedman who blogs about the use of computers points out that he skim-reads even short blog posts and his thinking has taken on a ‘staccato’ quality. Phillip Davis (among many others) points to the advantages of ‘skimming’ lots of articles – believing it makes us more efficient and creative than the older linear ways of reading and thinking. Others believe the net has made books superfluous. A research study by nGenera which interviewed six thousand members of what it called ‘Generation net’ found that young people don’t even read a page from left to right or top to bottom, they skip around, scanning it for areas of interest. It truly appears that the net is changing the way we absorb information. 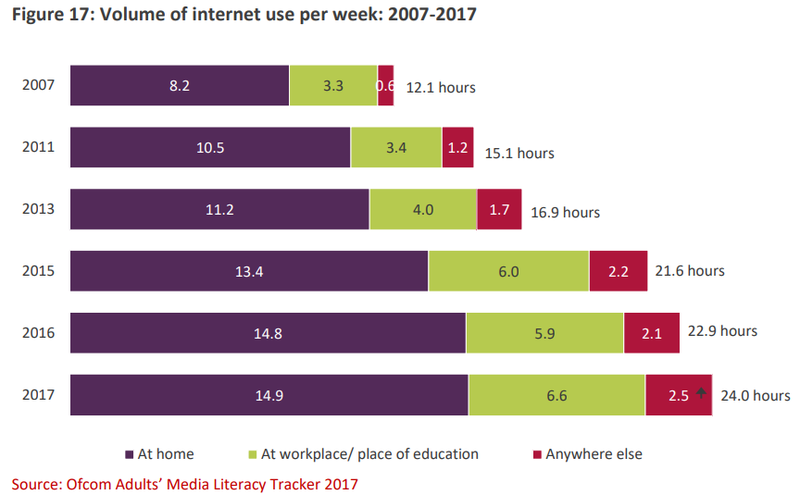 Even though there are different degrees of net usage, what is clear is that for society as a whole, the net has become the communication and information medium of choice… we have embraced its uniquely rapid-fire mode of collecting and dispensing information. This transformation is profound, and so are its likely impacts. We seem to have arrived at an important juncture in our cultural history – we are trading away our old linear thought process, calm focused and undistracted. These are being replaced by a new kind of mind that wants and needs to take in and dole out information in short, disjointed, often overlapping bursts – the faster the better. Ever since Guttenberg’s printing press, the linear, literary mind has been at the center of art, science and society. It’s been the imaginative mind of the Renaissance, the rational mind of the Enlightenment, the inventive mind of the Industrial Revolution, even the subversive mind of Modernism. It may soon be yesterday’s mind! Carr was born in 1959 and noes that for Baby Boomers and Generation Xrs, life began in the analogue age and gradually transitioned to the digital age from the 1980s onward. He was an English major at Dartmouth college and outlines how in the late 1970s he spent most of his time working towards his degree in the library, rather than in the cutting edge (at the time) computer center. He says that he didn’t feel the anxiety of information overload symptomatic of today’s online age despite the tens of thousands of books in the library. ‘Take your time, the books used to say to him, we’re not going anywhere’. When the net went Web 2.0 in 2005, he became a social networker, and a content generator, benefiting from the new ease of access to information and reduced barriers to publication afforded by new modes of connectivity. However, by 2007 he realised that his brain was ‘hungry’… it was demanding to be fed in the way the next fed it…. in 2-minute chunks. The internet was changing him into a high-speed data processing machine… being connected had made him want to be connected constantly… he wanted to check emails even when he was offline. For my summary of chapter two please click here. To purchase the book (it’s a cracking read!) please click below!